My friend Addy is studying forensic science in Scotland this year. Her Facebook status frequently updates us on her spontaneous weekend travels across Europe. Hence, my comments often express my jealousy at her situation. Come visit, she replies! Come visit and you, too, can experience the wonders of Europe! 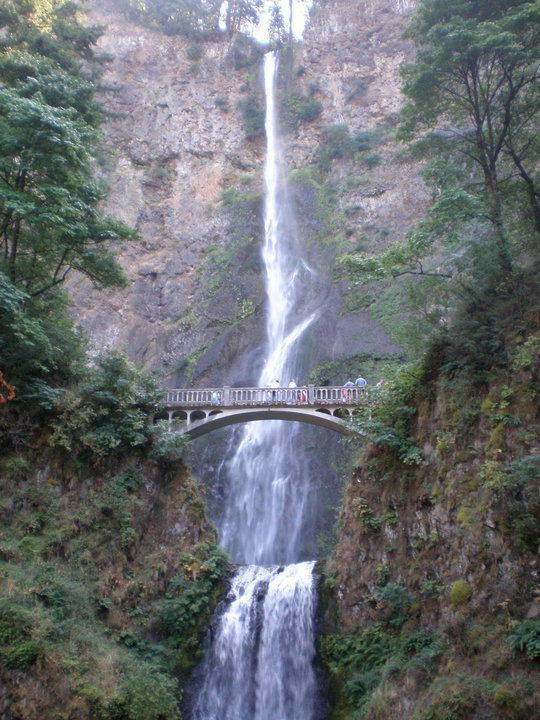 One of the favored destinations for young cash-strapped Oregonians is Multnomah Falls. In fact, other than the Oregon Coast, it’s probably the outdoor destination most often seen in Facebook photo albums. Anybody with an out-of-towner visiting knows that Multnomah Falls is the place to show off the natural beauty of our state. This holds true whether you head home afterwards or continue down the freeway toward additional destinations. Locals love the falls, too. Just yesterday my brother’s girlfriend asked if I wanted to go this very weekend. 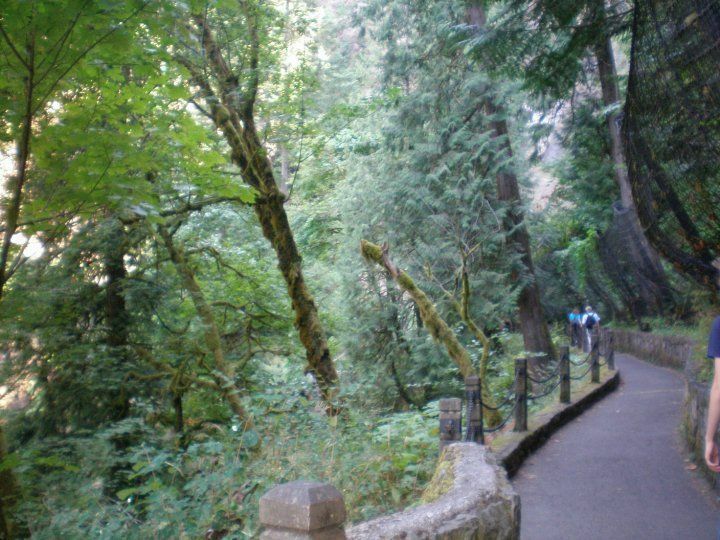 Best of all, Multnomah Falls is close—only 45 minutes east of Portland on I-84—and all it costs you is the gas money. 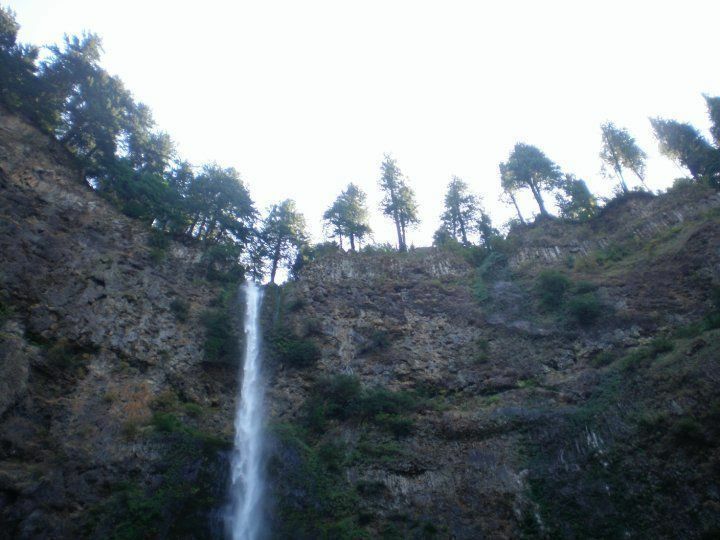 Multnomah Falls is also quite easy to find, and is right smack on the freeway in case you forget your map. Parking is free and generally pretty open, no matter the season. Once you’ve parked, head under the covered bridge and make your way the short distance to the Multnomah Falls Lodge. The Lodge itself is a neat place to hang out, and is certainly a picturesque example of rustic wilderness architecture. There’s food available, too, whether you’re up for a sit-down meal with the parents or a more budget-appropriate snack from the coffee shack. I will also note that the bathrooms are good—dark, and sometimes damp, but perfectly serviceable. Inside the Lodge will be your only other expense of your trip: the souvenirs. Multnomah Falls has a gift shop with neat glass eggs and some nice jewelry, but you don’t need to bother with any of that. Instead, head straight for the single greatest souvenir of all time: the squished penny! Choose from four regional designs, insert two quarters and your shiniest penny, crank the wheel, and voila! A fifty-one cent souvenir embossed with a gleaming memory of your trip. There’s no better way for a broke college student to commemorate their travels. At this point I’m so obsessed with squished pennies that even when I am someday a very old, very rich and famous author, I will still hunt for squished pennies to remember my journeys by. There are a couple other things you must do at Multnomah Falls: first, at the base of the falls, take the classic self-portrait of you and your friends with the falls in the background. This broad viewing area on the ground provides your first taste of the falls, a place where it constantly rains mist and radiates grandeur. It’s fun to look up at the falls from here, but it’s just a prelude to the prettiest lookout of the journey: the bridge. Even non-hikers can handle the gentle quarter-mile up to the bridge. This short hike through the lovely dripping year-round green of a classic Oregon forest only takes a few minutes. The bridge is wide enough to let people pass as you hang out taking pictures and getting damp from the impressively wide reach of the mist. My suggestion, especially if it’s a cold, wet day, is to bring a tissue or a cloth to wipe your camera lens. Otherwise your pictures may end up a bit blurry. Girls, a brush in your glove compartment would also be a good idea, as your hair may not withstand the wind and the wet during the wintry seasons. Something that always surprises me is how many people are at the falls, no matter the time of year. But there’s enough space that crowding is not too much of an issue, except on the bridge, where it can sometimes be difficult to get a picture without a couple of brightly dressed strangers in the background. Don’t let that discourage you; instead, entrust those strangers with your camera and get a photo of your own group! I usually journey only a few hundred feet past the bridge, the better to take more pictures, but you have the option to go up about a mile further. This path is a bit steep, however, so be warned. (I actually find the steepness more challenging on the way down than the way up!) Or, if you’re quite devoted, you can explore the six-mile trail up Larch Mountain. Of course, information about the hiking in this area is available at the Visitor Center in the Lodge. The higher you go, the better view you’ll have of the Columbia Gorge, which is one of the more magnificent Oregonian vistas all along its length. If your goal is to tour the Gorge, I would recommend a summer trip, which will get you gorgeous blue photographs of the clear sky and the deep aqua of the Columbia River sandwiching the vibrant green mountains. The great thing about Multnomah Falls as a destination is that you can head back home from there, or make a day of it and continue down I-84. All along the Gorge are plenty of worthwhile lookouts and state parks, and twenty minutes past the Falls is another popular tourist destination: Bonneville Dam. You can access the dam from either the Oregon or the Washington side, although it’s not possible to cross the dam itself. My favorite part is watching the salmon cross the fish ladders, so if that’s your goal, be sure to check on the best time of year to see lots of fish. There are also visitor centers on each side and opportunities to see the engineering aspect of the dam inside the powerhouses. Of course, don’t forget to look for the squished penny machine! And if you feel like driving on a little further, you’ll enter the town of Hood River, which offers more gorgeous viewpoints of the Gorge and of Hood River’s rolling agricultural landscapes. Perhaps I will not make it to Europe by the time my friend graduates. Perhaps I will have to wait until I have become that aforementioned rich and famous author. So rather than lament the fact that I cannot travel the world, I will instead begin those world travels in my own backyard. Something tells me, though, that when I get home from Europe, I will still crave the wild expanses of moss-covered trees and the sparkling freefalls of water that decorate my lovely home state.